When I saw that “purple” was today’s prompt, I immediately felt a little bit homesick. Or maybe mountainsick is the better word. 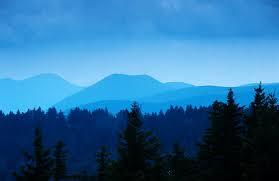 I live in a different(and flatter) part of the state now, but I grew up in the beautiful Blue Ridge of Virginia. Even though I moved away when I got married and my current home with my family really does feel like home to me, there’s always a part of me that longs for the mountains. Sometimes when we live somewhere, I think that the place impresses upon our hearts so deeply that it never entirely leaves us. That’s how the mountains feel to me. I grew up hearing family stories and all kinds of Virginia history, and the sight of my mountains has a way of soothing my spirit like little else on earth. In a larger sense, that’s how I sometimes think of the Holy Spirit indwelling our hearts, imprinting us with that whisper of Who we belong to and what is to come. Sometimes, too, I feel homesick for a place my earthly body has never yet been. Yet I know that God has a plan and a purpose for me. And, in my falling-short, imperfect way, I pray to walk just a little bit closer to Him each day and to set my face toward home.